So, Hogie (another Brewnoser & Aleander... look us up if you have no idea what I'm talking about) and I went down to The Gahan House tonight to try their new Pumpkin Beer. I didn't take any notes, like I normally would, but I did take a pic. We talked about the basics of the brew, and I think we came to a general two-man consensus. In more detail? The beer was a crystal clear orange-amber, with a finger+ of head. The smell started to match the flavour a bit as it warmed, but at the onset, it didn't tell you much. It just had - to me - faint notes of spice and maybe the yeast. Hogie thought it smelled like the inside of a hollowed-out pumpkin. The taste? It really was like liquid pumpkin pie. It had gentle / mild spicing, and a certain mellowness to it. A bit bright, but mostly smooth & mellow. Nothing stood out too much: carb, mouthfeel, any specific flavours. It was a solid, pretty-darn-well-balanced brew; more than I thought it would be. I've only been drinking Gahan House for about a year now and I must say that I haven't been disappointed yet. Keep up the great work...whoever it is that does the brewing. hope to get down before the week end to fill my growler. I have to disagree. 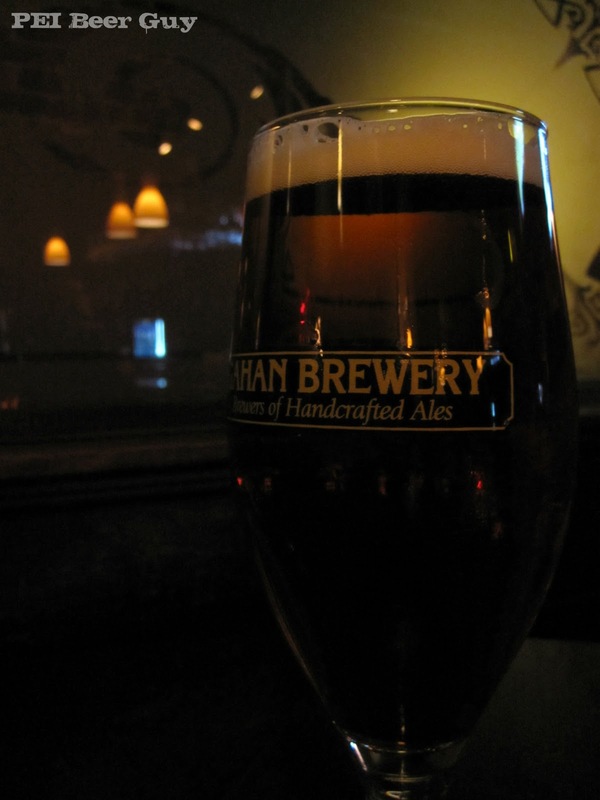 Overall, the beer at gahan lacks in flavor and balance. Their best brew is the Sir John A's, and it still underwhelming. With all that being said, I hope they continue to build their portfolio. What would be best for the gahan and PEI beer culture, the development of more breweries that produce great products creating competition limiting their hold on the suspect beer culture of PEI. Good luck to finding great craft beer gentlemen! Mackie, I can't say I disagree or agree with everything you say, but it seems as if they're trying a bit harder these days. I'm still a bit skeptical of them, too, but I wish you could try this brew as well as the batch of IPA they had in the summer (what's on tap now isn't the same... different hops). Keep your eyes peeled for new things from them (hint, hint) & maybe we'll hit them for a pint someday you're home. I will admit that since they opened they have added selection their portfolio which is commendable. As for their pumpkin beer, my wife is the pumpkin beer expert.....I dont usually like harvest or pumpkin beer, so if they bottle it next year maybe I will get the folks to send some down. Maybe my expectations are too high......when I think of a small brewpub, I envision: new beers being constantly brewed to keep the small, local clientele going back for more, a happy hour with beer and food specials to entice beer greeks and non beer greeks alike to dine and drink, and Firkins. Oh yeah, how's the beer from the new PEI?